(Left to right) - Frank Wagner 3B, Sam Meneice OF, "Cy" Dahlgren P, Max Smith P, L. Nelson P, Joe Custer C, Arthur O'Dea 1B, Lorne Livingston 2B, "Dad" Mills OF, Frank McGraw OF, Cook SS, Frank Summers OF. The photo was taken pre-season and Cook was released before the regular schedule began. Interestingly, the photo appears in at least three editions of the Brandon Sun in 1908 and at least once in 1909 without any names attached. The names (last names only) do show up in the photo published in the Winnipeg Free Press, April 25th, 1908. The second photo appears to have been taken at the same time (without sweaters) as the players are the same and in the same order. Check the faces (and in a couple of cases, the hats). 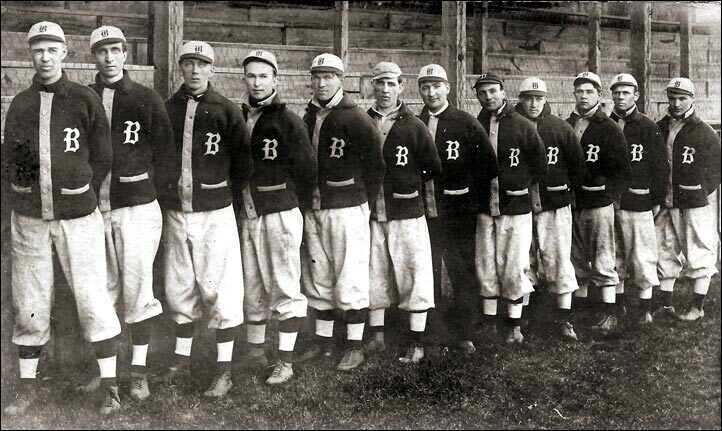 (Left to right) - Frank Wagner 3B, Sam Meneice OF, "Cy" Dahlgren P, Max Smith P, L. Nelson P, Joe Custer C, Arthur O'Dea 1B, Lorne Livingstone 2B, "Dad" Mills OF, Frank McGraw OF, Cook SS, Frank Summers OF.